Hasan Hakeem's Journal: Who was Dr. John Alexander Dowie? Who was Dr. John Alexander Dowie? John Alexander Dowie was born in Edinburgh, Scotland in 1847. His family moved to Australia in 1860. He began working at his uncle's shop as a shoe salesman. He had a bad temper and once during a disagreement he threatened to hit his uncle with an iron rod. Dowie did a few odd jobs here and there as a clerk and, in 1867, moved back to Scotland for further studies. He studied theology and some other subjects for 2-3 years. As his father could not afford to continue funding him, he was asked to return to Australia. In 1872, he came back to Australia and began a job search in the Church. Finally he was accepted at a congregational church in the small city of Newton near Sydney. Later, he moved and became a minister in a Melbourne Church. 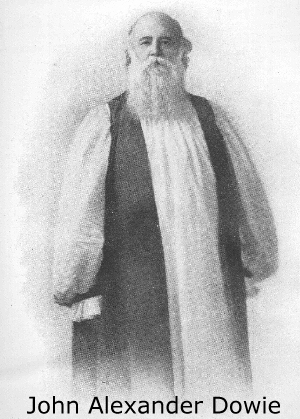 In 1878, he organized the International Healing Association. He was arrested many times during his stay because of his extreme protests against the wickedness that, according to him, abound in that area. In July 1888 he moved to the United States and arrived in the San Francisco area.He began his healing activities here; initially he was given a warm welcome, but later he began calling all those who helped him as apostates. He extensively traveled up and down the west coast. Passing through Utah, he arrived in Evanston, Illinois. This is where he began his ministerial work in a small wooden hut near the World Fair facilities. In 1896 he formed his own church, the Christian Catholic Church. He had an enrollment of 500 followers. In 1897, he established the Central Zion Tabernacle. In 1895, he was arrested over a hundred times for protesting against alcohol use and practicing medicine without a license. Slowly he began buying large parcels of land some 42 miles north of Chicago while keeping the attention of the media in his controversial pursuits in Chicago. On New Year's Eve, he gathered all his followers to an all-night service at the Central Zion Tabernacle. As the clock struck 12, Dowie drew the large curtain 25 ft high and 25 ft wide that was hiding the blueprint of the new City to be founded that he named Zion. The blue print was a piece of land 6600 acres in area along the bank of Lake Michigan. This was the beginning of the City of Zion. From this point on, he began to progress with leaps and bounds. Such a man was Dowie, who conceived the idea of a "City of God." Born in Edinburgh, Scotland on May 25, 1847, Dowie was endowed with faculties that have characterized other builders and dreamers. A precocious child in several ways, he read the Bible through at the age of six and signed the temperance pledge the same year. While in grammar school, he won the Dux Medal for excellence in his studies. To what extent his parents encouraged his latent capability is unknown. Nei­ther his father, John Murray, a tailor and occasional preacher, nor his mother, Ann, an illiterate widow at the time of her marriage, were known for any unusual accomplishments. In 1860, the Dowie family moved to Adelaide, South Australia, where John Alexander was employed by his uncle, Alexander Dowie, who owned a shoe shop and was engaged in the import business. After a short time he left his uncle and became a clerk in a wholesale dry goods firm. There he received extensive business training and rose to a junior partnership in the firm. Business, however, did not satisfy young Dowie's yearnings and he began to receive tutoring to prepare for the ministry. He returned to Scotland in 1869 and entered the University of Edinburgh. The diary he kept on the voyage to Scotland shows his interest in the scripture and evangelism, a fierce dislike for liquor, and an eagerness to discuss its harmful effects. Accordingly, during the three month trip, he was regularly involved in personal witnessing, directing a Sunday school, and helping to plan and lead worship ser­vices aboard ship. At the University he studied the classics and political science. His classes included Latin, Greek, Logic, and Moral Philosophy. Like other students, Dowie had not entirely made up his mind about his future. He had wanted to leave Edinburgh in 1870 and go to Berlin where he could preach, learn German, and study philosophy at the university. The start of the Franco-Prussian war, however, made this impossible. In 1876, the first noted healing occurred in Dowie's ministry. He did not know this at the time, but healing eventually became the hallmark of his ministry. An epidemic had already killed forty of his flock. Dowie later wrote that as he was sorrowing and meditating in his study about the thirty others lying sick, whom he had just visited, the words of Acts 10:38 "stood before him all radiant... revealing Satan as the Defiler and Christ as the Healer." He already believed that disease was not God's will but was the work of Satan consequent upon sin. As his heart was being strengthened from this reminder of the work of Jesus and the power of God, he received a call to come to the bedside of a young girl who was dying. Dowie's anger burned. He said he wanted "some sharp sword of heavenly temper keen to slay this cruel foe who is strangling that lovely maiden like an invisible serpent, tightening his deadly coils for a final victory." Dowie hurried to the bedside of the stricken girl, where he joined the family. When the Christian doctor who was present asked, "Sir, are not God's ways mysterious?" Dowie said that the weapon he wanted was in his hand—"The Spirit Sword, the Word of God." "God's way!" he answered, "How dare you... call that God's way of bringing his children home from earth to heaven? No, sir, that is the devil's work, and it is time we called on Him who came to destroy the work of the devil." Dowie was frenzied, he said, with "Divinely imparted anger." Immediately the girl was healed in response to his prayers. The remain­der of his parishioners recovered as well. Dowie had won a tremendous spiritual victory. His faith was increased for other major accomplish­ments. The many healings which followed in his ministry strengthened his belief that God was the source of all that was good." Because he had little formal preparation in theology, the preacher's beliefs were based primarily on his own interpretation of the scriptures. As a young minister, he made up for his lack of schooling by spending long hours studying so he could rightly interpret the Word. For one who was to establish a new faith, his scant theological preparation seemed to be no hindrance. Dowie looked to no authority other than the inspiration of the Spirit and did not need a denominational frame­work for his ministry. By 1877, he had decided to found "by God's help, a Free Christian Church" in Sydney. Dowie was going to order his own affairs in his service to God and democratic, denominational devices would never bind him. The "real" father of Pentecostalism? Dowie's Zion: A haven for African-Americans?